What is the functional objective of the awning – shading, weather protection, identification, or aesthetics? Is the awning going to include fans, lighting or televisions? Is the covered area going to be revenue producing or simply for aesthetic appeal? Awning are extended coverings which can be attached to a building or freestanding. They are usually constructed from tubular steel or aluminum frames and covered with fabric. 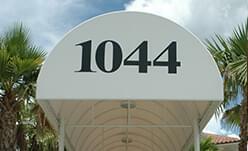 Mostly, awnings are custom manufactured and can be designed to fit most any architecture. Awnings offer the flexibility of covering large areas at a fraction of the cost compared to traditional building methods. 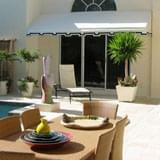 Restaurants and hotels often use awnings to cover substantial outdoor areas for outdoor dining, parties, or reception. On commercial store front buildings, graphics are often applied displaying information like the companies name, address or branded logo. 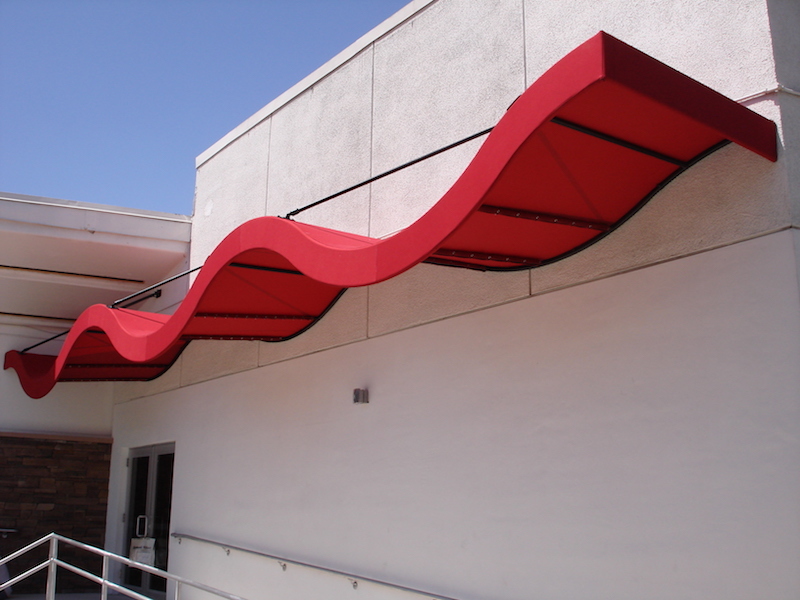 This allows the awning to act as a sign or billboard as well as providing shade, breaking strong winds, and protecting from rain or snow. The configuration of the surrounding architecture will play a major role in determining the configuration of the awning. When designed properly, awnings are excellent at providing revenue producing areas or signage at a fraction of the cost compared to traditional building methods. The color of the fabric also plays a major role in the design of an awning and the approval process of governing authorities. 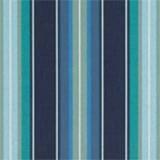 With the many choices of color throughout the many fabric lines available, you can rest assured knowing that there will be a fabric in the right color to suit any client’s needs. The size of an awning is determined by the amount of coverage desired, or square foot coverage. Other key elements of size include clearance from the ground to the bottom of the cover, overall rise (pitch + double front bar), and column spacing. These features are usually important to those involved in the planning and review process. Coverage area can range from just a few square feet to hundreds or even thousands of square feet. To supply an efficient, practical and economical awning, a professional must first understand how to correctly design, size and connect all structural members. The number one requirement of any project must be that the foreseeable loads will be transmitted to its supports while incorporating safety factors, without over-engineering the system while achieving the design intent. Sounds simple, right? Involving an awning contractor early in the design process is highly recommended for a few reasons. By allowing an awning contractor to design the project from in its infancy you can most often reduce/eliminate costly change orders, provide the customer with more accurate information, end up with a product that exceeds everyone’s expectations and outlasts the expected lifecycle. By selecting a contractor with AutoCAD capabilities the designs can be inserted directly into the projects master plans, saving time and money. Remember that a sound structural, economical and practical design does not necessarily result in the lowest cost but will provide the most value for the customer. Except in rare cases, this is not a significant issue with modern awnings due to the advancements in flame retardant fabrics and coatings. In most cases, awning materials are noncombustible and certified as flame retardant. However, safety pertaining to egress should be taken into account whenever appropriate, such as for enclosed walkway or patio awnings. The code generally allows for outside awnings with motorized curtains to provide an open, safe and quick exit to a safe zone. This can be accomplished by providing an exit opening or emergency exit door and by integrating motorized curtains with the fire control panel – automatically retracting the curtains in the event of a fire. Although some building departments do require fire sprinkler systems for awnings over a certain square footage, they are generally not required for most standard size installations. The average designer may have a concept of how beams and posts work structurally. But to design a safe structure, one must fully understand stability issues. Common post and beam structures, such as pole barns, are rendered stable by the addition of siding, roofing, “X”- bracing and fixed cantilevered footings. Fabric has no in-plane stiffness; therefore, it does not replace, in an awning or canopy, the function that siding or roofing performs as in a pole barn. This in-plane stiffness, which is instrumental to the development of stability, can usually be supplied by the diagonal bracing of structural members. Although the fabric covering does not provide in-plane rigidity, it can apply extraordinary forces individual frame members. These forces do not affect the structural integrity of the frame but can cause undesired wrinkles if not properly accounted for. Anchoring a properly designed awning to a solid sub straight is just as important as the structural integrity of the awning itself. This involves the location, style and strength of connections from the awning or canopy to the building or to its foundations. Proper design of this element assumes a recognition of the amount of force occurring, and the direction in which this force acts, at the connection at the time that the maximum design load occurs on the frame. After a stable configuration has been established for an awning design frame, members should be chosen for a strength consistent with the amount and type of stress imposed on them. The most common types of stress are tension, compression, bending and shear. Engineering standards have long required that a safe design use members that are 1.67 to 2 times stronger than the yield strength required to satisfy the actual design stress. The yield strength is the strength at which the material no longer fully recovers to its original shape when the load is removed; the yield strength is usually significantly lower than the ultimate strength. Thus, it can be immediately recognized that a “safe” structure is stressed well below its breaking strength when it is exposed to its maximum design load. Provisions must be made to drain water off an awning. Fundamentally, this involves establishing a steep enough pitch, properly spaced bows or rafters, as well as maintaining a taut fabric, so that draining water or melting snow cannot cause the fabric to sag and collect water on the surface. Lack of proper attention to this detail can result in potentially large gravity forces on the frame and anchors. Awning designs can include pitch variations from 1:12 to 6:12 depending on fabric selection and the sites geographic location. Contact a site local awning contractor for such design considerations.